So I just Karate chopped a giant frozen burrito. After three karate chops, I was able to break it in half. Unfortunately, I now have a slight bruise and am bleeding a little bit. I think that it was totally worth it though, and am pretty pleased with the result of this burrito experience. My girlfriend (who happens to be a third degree black belt in Tae Kwon Do so u know she is legitttttt) said that the burrito was harder to break then several pieces of wood, so I feel much manlier now. 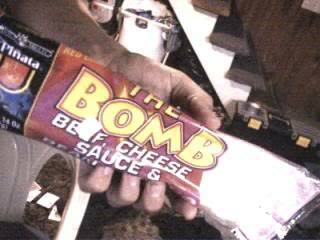 I encourage you all to buy a Burrito Bomb and to karate chop it. Try to beat my three karate chop record~! I may even try karate chopping two of them, stacked on eachother now. Note/Caution: You may hurt yourself doing this. Do it at your own risk and responsibility. I am totally kidding about challenging me… unless you are Foose. This entry was posted	on Monday, November 30th, 2009 at 3:51 AM	and is filed under Funny. You can follow any responses to this entry through the RSS 2.0 feed. You can leave a response, or trackback from your own site. i will totally buy this burrito and break it in two chops, hopefully one. There’s really no point in trying to stop Foose even if you’re joking, is there?